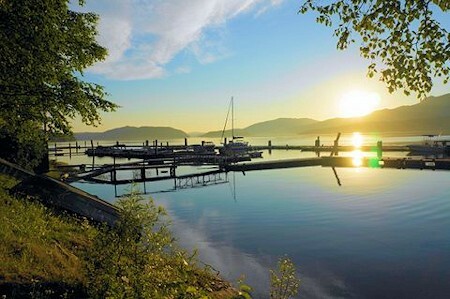 Come and enjoy the beautiful and peaceful setting of Plato Island Resort & Marina, your gateway to the wild beauty of unforgettable Quesnel Lake, located 36 km northeast of the historic community of Horsefly, on the southwest side of Quesnel Lake in the Cariboo Chilcotin region of British Columbia, Canada. 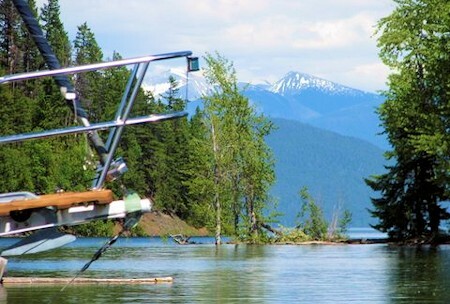 Quesnel Lake is vast, stretching over 145 km from the small community of Likely in the west to the lofty peaks of Wells Grey Park in the east. Quesnel Lake is said to be the deepest inland fjord lake in the world. The lake boasts some of the best game fishing in BC with Rainbow Trout, Lake Char, Dolly Warden, Kokanee and various other species. You will find a fish cleaning station on our docks; freezer space and ice are available. 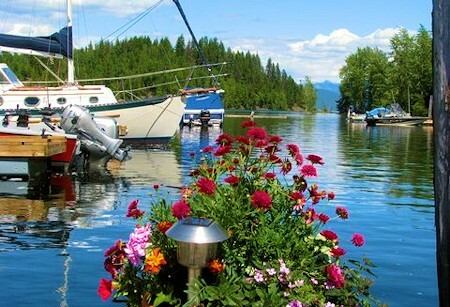 We offer well protected moorage on a daily or seasonal basis. 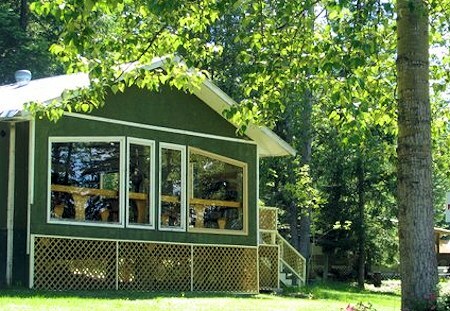 .establish your "weekend cabin" by the lake. Please call us for details. 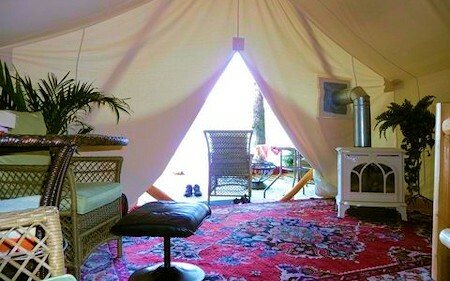 For those who are tired of roughing it, or are looking for the ultimate romantic get away, try "glamping" (glamorous camping) in our amazing "White Cloud" luxurious wall tent. 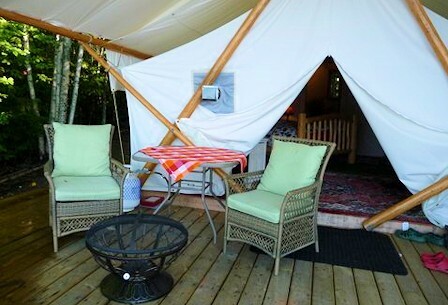 A queen log bed, down duvet, lush Turkish carpets, luxurious en-suite bathroom, fire place, a big deck overlooking the sandy beach and Marina and sunsets to die for. 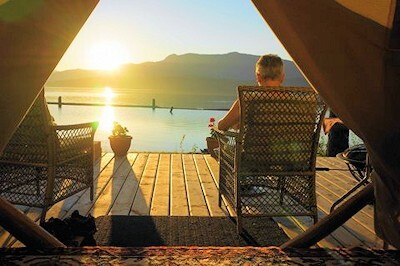 Have yourself pampered and experience luxury on the edge of the wilderness. 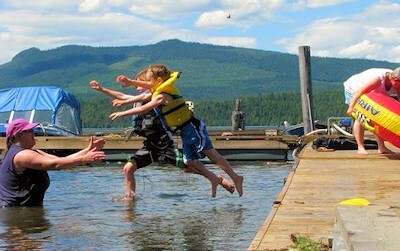 Plato Island Resort & Marina is ATV friendly and we welcome hunters during the fall season. Premium gas is available. There is access to unlimited miles of walking, biking, riding and driving trails. Come and enjoy a family camping experience, playground for the kids, our annual "Musik Fest" in August, great fishing, sandy, safe swimming beaches, stunning scenery and above all a welcoming, friendly atmosphere. Try our Café which will surprise you with delicious, quality meals with European flavor. We cater to special occasions. At Plato Island Resort & Marina we recycle and grow "greener" by the season. 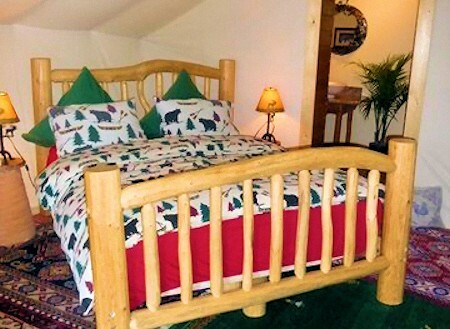 We love it here and think you and your family will too. Have fun. Marita, Kyle, Clint, "Turbo" (the cat), "Diesel" (Yorky mascot) and the chickens (where the eggs come from).